In the aftermath of devastation from Hurricane Harvey and grief from the Santa Fe shootings, the June 21, 2018 Kids’ Day at Hobby Center performances reflected part of a healing process. Mixed with cultural celebrations of traditional Mexican and Brazilian dance and African drumming, the voice of youth opinion, fear and hope was evident in the performing arts productions. 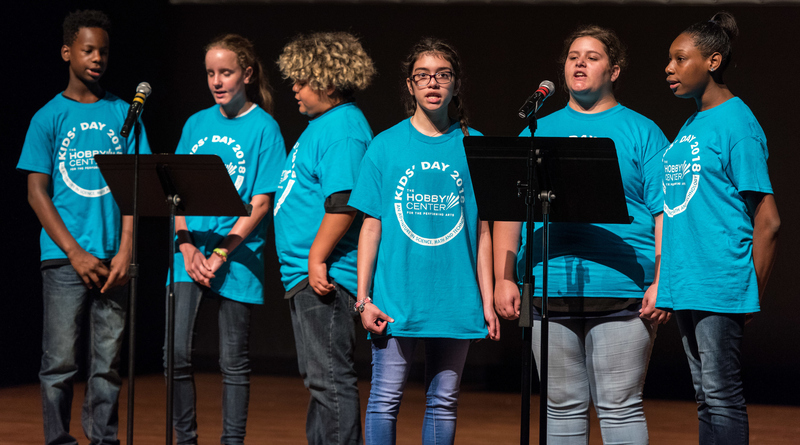 Led by local performing artists and influenced by the youth enrolled in summer programs, Kids’ Day at Hobby Center gives students enrolled in summer enrichment programs the opportunity to express themselves through dance, theatre, puppetry, song and visual arts. The Center for Afterschool, Summer and Enrichment for Kids, or CASE for Kids, has provided the enrichment opportunity each summer for the past 10 years through various partnerships, including Hobby Center for the Performing arts. “I like theatre because it allows me to express myself,” said Stafford High School student Jaylah Allen, who performed in a production written by the students with assistance from Ensemble Theatre performing artist Anthony Glover. Glover says theatre is a healthy outlet for youth because they can talk about life through theatre. Teens talk and act out things they are going through and broach subjects like bullying, suicide and violence. “It also allows me to prepare for speeches and presentations that will help me in the future,” said Allen, a college-bound eleventh grader. The event gives students the chance to learn from the local professional artists and perform on the iconic stage in downtown Houston. Students worked with the local performing artists like puppeteer Greg Ruhe, hip hop artist Chris Cortez, drummer Sam Dinkins and visual artist Monica Foote. The schools included Best and Smith elementary schools and Albright Middle School in Alief; Bammel Middle School in Spring; Garrett Elementary School in Sheldon, Stafford High School in Stafford, Clear Creek Intermediate in Clear Creek, and Francis Elementary in Aldine. Charter school Academy of Accelerated Learning also participates. Fine arts vendors working with CASE for Kids in the summer program include MECA, Ondi Love, Brazilian Arts, Dinky Drum, Savannah Blue, Artist Boat, Puppet Pizzazz, Houston Healthy Hip Hop and Ensemble Theatre. For more about CASE for Kids or Kids’ Day at Hobby, go to www.afterschoolzone.org.